In the last 60 years, government transfer payments -- such as Social Security and unemployment insurance -- have quadrupled as a share of personal income. Today nearly one of every five dollars comes from Uncle Sam. This figure would be much more dramatic if it considered only the bottom half of earners, taking into account tax credits, Medicaid, and other programs that offset spending or boost income for least fortunate. Catherine Rampell calls it the "dependence economy." 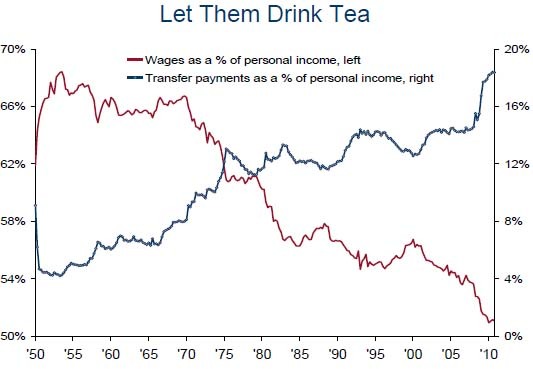 I find it rather extraordinary that wages account for only half of personal income.